Today is the first day of Christmas vacation for my kids and no joke, the "I'm bored" comments are already starting. How they can be bored when they have a brand new playroom with countless toys and video games is beyond me, but there you have it. So with days and days (and DAYS) ahead of us before school starts back up, I'm left with the task of keeping them busy and happy. 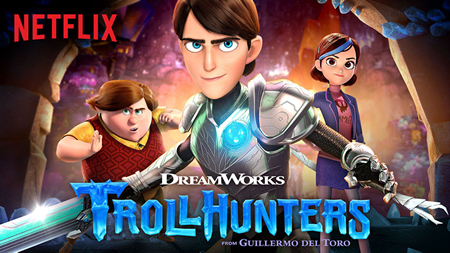 Thankfully we have some snow still on the ground to play in, but when they come in from the cold we also now have the highly anticipated DreamWorks Trollhunters to stream on Netflix! I have to say I am super excited about this new Netflix Original Series as it looks like something the whole family will enjoy. From the limitless imagination of acclaimed filmmaker Guillermo del Toro comes a tale of two worlds set to collide in the epic saga DreamWorks Trollhunters. When ordinary teenager Jim Lake Jr. stumbles upon a mystical amulet on his way to school one morning, he inadvertently discovers an extraordinary secret civilization of mighty trolls beneath his small town of Arcadia. Suddenly destined to play a crucial role in an ancient battle of good and evil, Jim is determined to save the world – right after gym class. A must-see viewing event for the entire family! Now the real challenge for us is going to be NOT binge watching all episodes in two days. My goal is to make it last through winter break so we have a new episode to look forward to every day. Lucky for us that today is not only the first day of vacation, but the first day of Trollhunters! We can't wait to get started.